The Hottest Make-Up Products to Buy This November! The latest beauty products are hard to miss in November. From base make-up to lipstick, here’s what you need to have this month. Double Wear Light is the new foundation from Estée Lauder that perfect for you who want always be ready for taking photos. The lightweight foundation blurs your pores because it has light-to-medium coverage that makes your make-up look more natural. With soft-matte finish and infused with concentrated hyaluronic acid, it will help to control your skin’s oil. You can choose the perfect foundation for your skin with its variety intensity level from light to deep and also available in cool, neutral, and warm undertones. Clé de Peau offers a hybrid of concealer and skincare with color-correcting coverage. It corrects the dark tone of under-eye circle with color-correcting pearl that blending red and yellow agents. Contains Illuminating Complex EX, it hydrates the eye area. This ultra-light concealer that settling into fine lines can help to brighten and clarify your under-eye. Has six different shades, this concealer is perfect to cover your skin’s redness and dullness. It also adds luminosity to your skin appearances for an extra dimension. The Rouge Dior Ink Lip Liner is the first liquid lipstick in a couture felt-pen made by Dior. This is the perfect for you who want a define lip because it has ultra-fine felt tip. Available in 12 shades, it’s highly pigmented to make your lip lines look sharp.. With a semi-matte finish, Rouge Dior Ink Lip Liner will lasts up to 12 hours. Glow Living Beauty, Plaza Indonesia. Guerlain has invented its first customized lipstick. You can choose your shade and its case to create your own lipstick. There is a wide range of shades, from the natural to the glamorous. It contains plant-based polymers and silver microcrystals,, which will give you an intense and long-lasting colour. This lipstick has hyaluronic acid and guggul resin for smoothed and plumped lips. One more interesting fact is that it has a double mirror in its case so you will be easier to wear the lipstick everywhere. Couture Blush is the first weightless blend-able blush by YSL. The ultra-fine smooth yet concentrated texture is extremely lightweight so it can deliver high colour impact without over-applying. It has high concentration of pigments so the powder blush allows a variety of finishes from sheer to intense. 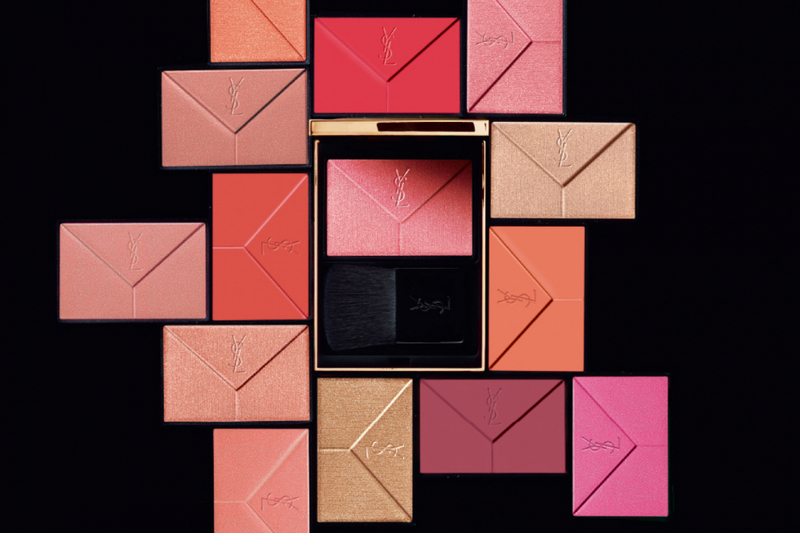 YSL Couture Blush has non-powdery, long lasting finish, and available in ten shades-from satin to shimmer. Shu Uemura just released a limited edition palette that features eight eyeshadow shades in collaboration with La Maison du Chocolat. There are two eyeshadow palettes that you can choose; “dark cocoa” for bold chic looks and “framboise berry” for sweet elegance. Each palette’s packaging is inspired by a box of assorted chocolates and features colours with silicone-coated powders that glide smoothly onto your eyes. So, have you decided on which one will you buy first? Tag us in Instagram and share your review to @prestigeindonesia #prestigeindonesia!